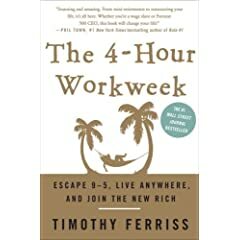 I’ll do a more in-depth review of this book when I’m done listening; it’s one of the most compelling business books I’ve encountered. As the authors say, Good to Great is, well… great, but they argue that the real unit of analysis needs to be the strategic move. The main point is that companies that succeed in creating blue oceans of relatively competition-free markets identify product offerings that can attract the industry’s previous non-customers. They do this by finding key factors that, if present, would turn these non-customers into customers. Then they eliminate or reduce everything else, to provide great value at an attractive price. Southwest Airlines, Apple, Casella wines, Novo Nordisk, Home Depot and Curves exercise clubs for women are among the profiled companies that followed this strategic approach. In every case, the companies needed to think creatively and offer an innovative product or service to find these blue oceans. In hindsight, their moves may seem obvious. But they weren’t obvious at the time. These companies resisted taking the customary but uncreative approach of benchmarking against competitors and trying to offer a little more at a slightly better price for increased market share, which would have been a recipe for commodity pricing and low profitability. As the authors indicate, a specific kind of creativity is needed to unlock blue oceans. It finds value innovations that provide compelling value to customers and non-customers. It looks at why non-customers don’t buy from your industry, and what you can do to attract them. 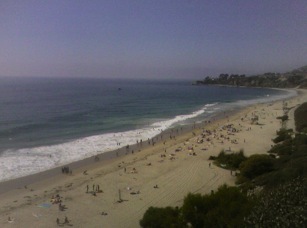 I had planned to wait to do this review until I was done with the book (and I will finish it later), but I couldn’t resist posting this much when I got to the Ritz Carlton Laguna Niguel for the Arthur W. Page Society’s Annual Conference, and saw the beautiful blue ocean you see in the picture above. The camera phone obviously doesn’t do it justice. We heard an interesting keynote this evening from Miles White, CEO of Abbott, who kicked off the conference. Laura Hall from Wieck Media will be writing the official conference blog, which will be linked to the Page Society web site. If that blog is available to non-Page members, I will link to it. The conference organizers have asked presenters to be provocative and controversial, and Mr. White certainly fulfilled that goal. As a CEO who has been through some high-profile public controversies, he brought home the fact that “red oceans” aren’t always made bloody by competition within your industry, but sometimes by the agendas of “stakeholder” groups. Merlin Mann’s great “Inbox Zero” talk to Google.